Ear piercings are amongst the most common and basic body piercings, widely accepted within most social groups and cultures. Many people wouldnâ€™t even remember their first piercing experience, having their earlobes pierced at a very young age. Ear piercings arenâ€™t just limited to the earlobes, however; you can be as creative as you like with virtually endless possibilities! You can find an amalgam of jewellery on the market, or even have your very own custom-made design to suit your every needs. Ear modification and piercing procedures available today can allow you to design virtually everything about the look you want, simply by visiting a piercing studio and discussing your ideas! 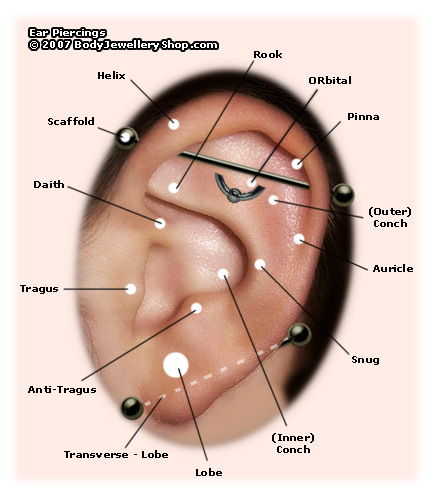 The many different types of ear piercings are found on different parts of the outer ear, Â which are shown below. You can also read more information on each ear piercing further below the diagram. The Anti-TragusÂ is the raised fold of cartilage that sits on the outer side of the ear, above the ear lobe and just opposite the tragus. Some people may find their anti-tragus is too small to be pierced, however micro (smaller)Â jewellery is often successfully used. Ball Closure Rings can be used, but theyÂ may flop about and aggravate the piercing. Using a curved barbell or labret stud will probably improve the chances of a quick healing. The Auricle (Rim) piercing is the cartilage rim that runs along the side/edge of the outer part of the ear (away from the side of the head). Many people like to use Ball Closure Rings for this piercing, athough they are more prone to movement and to catching on hooks or clasps etc, thus aggravating the piercing. Labrets and barbells that arenâ€™t too long will help minimise snagging. Usually, jewellery that is a millimetre or two larger than the thickness of the cartilage is sufficient. The Conch is the large area of cartilage that makes up the back of the ear. Although large diameter Ball Closure Rings have been successfully used, this piercing heals quicker when a labret or barbell is used. The gauge can be anything up to 3.2mm but the length need only be a couple of millimetres larger than the thickness of the cartilage; usually 8mm long is suitable. The Daith (Crux of Helix) is the fold of cartilage that sits beneath the rook and is closest to the ear canal. There must be enough cartilage to comfortably hold the chosen jewellery. Micro jewellery (1mm to 1.2mm gauge) often rests well in most Daith piercings because the Daith can be quite shallow, and the diameter of the ball closure ring can be as little as a couple of millimetres larger than the thickness of the pierced cartilage. Curved barbells are a better choice, over straight barbells and labrets. The Industrial piercing (also known as a Scaffold)Â is where two or more separate rim (or cartilage) piercings are joined by one barbell. This procedure can be performed as separate piercings with separate jewellery and allowed to heal individually; but can also be fitted with one PTFE barbell, which will decrease the amount of tension placed on the structure of the cartilage itself. The piercer should carefully mark and plan the piercing so the gauge is suitable for all the tissue it travels through. The Orbital is a piercing which enters and exits through the same area of the ear using a circular piece of jewellery, such as a Ball Closure Ring or Circular Barbell. TwoÂ piercings next to each other are ‘adjoined’Â usingÂ the piece of jewellery which sits through both holes.Â This piercing is sometimes more successful when made as two initial piercings, with separate jewellery; but with careful planning one piece of jewellery can later be fitted into both healed holes. The Ear LobeÂ is the fleshy tissue that hangs at the bottom of the ear. It gets plenty of blood supplied to it and thus should heal fairly quickly. If piercing the lobe, try to make sure the piercing is central in the lobe itself. Rings, barbells or labrets can be worn, though barbells and labrets do not need to be much longer than 8mm; the rings are often around 10mm or 12mm in diameter. The dimensions of the earlobe will effect the gauge used, but it is common to find that anything up to a 3.2mm gauge is used. Some piercers have pierced initial piercings with a larger gauge, using a dermal punch technique. This can guarantee that the initial hole will never close, which can be a serious commitment for many people. The Pinna (Helix) is located on the cartilage rim along the top part of the ear. Usually a small diameter Ball Closure Ring can be used for this piercing. Even the labret or barbell can be â€˜microâ€™ jewellery (at 1mm or 1.2mm gauge), and need not be any larger than 8mm. The Rook is the highest fold of cartilage, beneath the Helix. Make sure that there is enough cartilage to support the jewellery comfortably. If a shallow Rook is pierced with large gauge jewellery, the jewellery has a higher chance of migrating (but a thin gauge, or Micro, jewellery can migrate faster!). Ball Closure Rings, Curved Barbells or PTFE Barbells are recommended for this piercing. The Snug piercing is located through the inner cartilage, halfway down the outer rim of the ear, above the anti-tragus. In most cases this area is quite shallow, and micro jewellery is often used. Curved barbells are preferable and need only be a few millimetres longer than the thickness of the cartilage. This entry was posted in Ear Piercings on November 12, 2008 by Piercing Guru.